A fresh fishing row has broken out after claims that British crab pots are being damaged “deliberately” by French trawlers. The alleged incidents occurred between the six and 12-mile limit off the Cornwall coast. The latest tensions come days after a deal was struck to end the scallops wars in the English Channel. The Cornish Fish Producers Organisation is discussing the issue with French fishermen in Plymouth. The lost or damaged gear is believed to have cost the Cornish fishing industry hundreds of thousands of pounds. 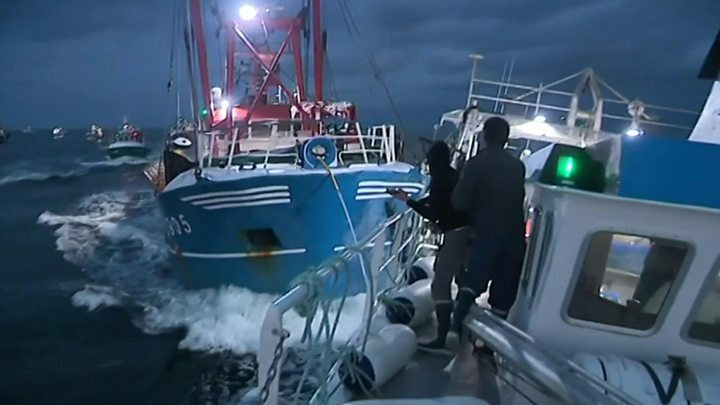 French fishermen – who are allowed in British waters – are notified of the position of British crab pots, but there are still multiple reports of damage. Local skipper Mikey Taylor-Firth said he spotted a French trawler towing nets with “not a care in the world”. “These are deep-sea trawlers capable of working in any weather conditions, yet they can be seen from shore almost continually,” he said. “We’re out here in boats a third of the size and mostly single-handed having to deal with this on a daily basis. Another fisherman, Jake Gilbert, said 160 of his pots were missing. Cornish Fish Producers Organisation chief executive Paul Trebilcock said some fishermen were speculating that the damage could be Brexit-related, or from frustrations “spilling over from the scallop wars”. “It’s not acceptable for French boats to do deliberate damage within the UK’s 12-mile limit. “It’s just a lack of respect for fishermen in general,” he said. The Department for Environment, Food & Rural Affairs (Defra) and the French Embassy have been contacted for comment. The Royal Navy said it was a matter for Defra. In August, boats collided and fishermen threw stones at each other as the French accused UK boats of depleting scallop stocks.